This church was dedicated to Saint Hallvard, Oslos patron saint. Hallvard Vebjørnssøn (1020-1043), was canonised having tried to defend an innocent female slave. The Church of St. Hallvard was built in the beginning of the 12th century in romanesque style with a long aisle and two side aisles and a central tower. In style it would have resembled Gamle Aker kirke that was built in the same period. In 1260, during the reign of king Sverre, parts of the church was torned down and a gothic quire, the size of the main aisle, was built. Sigurd Jorsalfare, the famous Norwegian crusader king, was buried in the church of St. Hallvard in 1130. 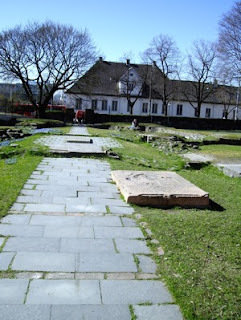 The church fell into disrepair after the main city was moved closer to the fortress in 1624, and in 1780 they used stones from the remaining ruins to strengthen the old road to Oslo. Some of the stones from the medieval church can also be seen in today's cathedral. Still you can clearly see the stones outlining the walls of the old church, and walk down the aisle. By the entrance you can see a few graves, that may date back to medieval times. 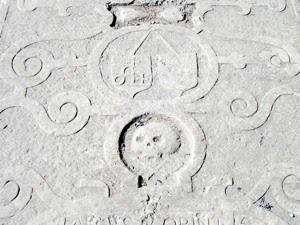 Inside the church are two stones that clearly indicates the graves of two prominent members of the elite in old Oslo, one from the 16th century and one from the 17th century. This is the grave of Magdalena Franzdatter married to Jens Nielsen. 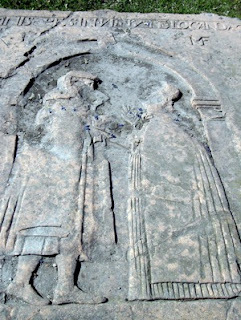 She died in childbirth and the stone shows them both, facing each other, dressed late 16th century clothing. On the stone you can read the following text. Anno 158*, February 12th, died the honest, chaste, and God fearing woman Magdalena Franzdatter, Master Jens Nielsen Superintendents wife with her fetus, and lies her in hope of **** resurrection on Judgement day. Anders Lauritzen was an official working for the very powerful nobleman Jens Bielke, Norwegian chancellor from 1614-1648. Anders Lauritzen was in charge of the estate that once belonged to the Nonneseter Monastery, situated in Old Oslo. On hi stone you can see his coat of arms. There is the following text on the stone. HER LIGGER BEGRAFVET ERLIG WIS OG WELFORSTANDIG MAND ANDERS LAVRISEN SOM VAR WELB. JENS BIELKES FOGED OFVER NVNNE CLOSTER GODS SOM DØDE PAA TØYEN DEN 28 DECEMBRIS 1627. Here are buried hones, wise and "well read" man Anders Lavrizen that was Jens Bielkes "foged" over Nonne Monastery Estate and died at Tøyen February 28th 1627. Old Oslo - how to get there. The Church of St. Hallvard and the other remains from the Medieval era is situated in Old Oslo, in downtown Oslo. The easiest way to get there is to take tram line 18/19 - direction Holtet / Ljabru and leave at St. Hallvards plass.